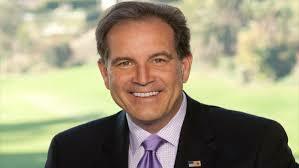 Just came across a foreword written in 1999 by our Board of Director Member Jim Nantz for a book entitled "Total Olympics" by Dr. Bill Mallon, an orthopedic surgeon, former professional golfer and a leading authority on the history of the Olympic Games. Unfortunately, the book was never published. However, since this essay was so wonderfully written about Nantz's experiences covering the Olympics in three countries - France, Norway and Japan - I believe it should be read by all those who love the Olympics, or for that matter any other sporting event. The article, as written by Jim Nantz, is published in its entirety below. Like millions around the world, I am passionate about the Olympics. How can you not be if you teeter on the edge of being a hopeless romantic, or if you have faith in the human spirit and believe in the basic principles of the Olympic oath? I love the Olympics for myriad reasons, but above all, I love its ability to unite. Nothing in the past 100 years has shrunk the world with the same effectiveness as the Olympics. Sure, the world has become far smaller thanks to technology. From aviation to computerization, the ability to reach and communicate with all corners of the world has evolved in a most remarkable century of invention. However, by comparison, the Olympics are well past the embryonic stage. Its roots go back 3,000 years. Yes, it went through a centuries-long period of dormancy, but it remains the ultimate international sporting competition, just as it was in ancient times. I suspect that 3,000 years from now, the Internet as we know it will be a distant memory and airplanes will have long been replaced by some other form of high-speed travel. However, the Olympics will still be running strong, uniting the world as one people. I grew up with an insatiable appetite for the Olympics. I could not get enough of it, owing a large part of that affinity to ABC’s incomparable storyteller, Jim McKay. His ability to capture the emotion of the games while carefully guiding and educating his audience was extremely powerful. So much so that by the age of 13, my mind was made up, I wanted to be a sports broadcaster just like Jim McKay. Luckily for me, I have experienced three Olympics “up close and personal”. My childhood dream was first realized at the 1992 Olympic Winter Games in Albertville, France. My boundless ambition to get started led to three pre-Olympic trips to the breathtaking Savoy region to uncover and absorb every cultural fact I could find. I spared no personal expense, all the while meeting fascinating people from neighboring hamlets in the French Alps. It was here where I came to appreciate that the Olympics are far more than an athletic competition. In many ways the beauty lies in the relationships. In my quest to research the coming games, I found myself being invited into private homes for dinner. I spoke little French, but the language barriers were of no concern. The Olympics has a way of doing that, stripping one of political, religious, or cultural differences, cutting to the core of that basic human spirit. I know this ideology sounds simplistic, but I truly lived it and felt it and was forever changed by it. One night during the games a family in the lovely French town of Megeve invited me over for dinner. It was a joyous evening by a roaring fireplace with wonderful homemade bread and red wine. Dinner was served in a raglette, a local version of the fondue pot. For the night we never exchanged more than 10 words as my esteemed hosts spoke no English and, as I stated, my linguistic skills were limited. Nonetheless, we engaged in what I treasure as one of the most pleasurable evenings of my life. To me, it was the definition of a true Olympic experience. In 1994, CBS went on to broadcast the Lillehammer Olympics. The Norwegians were just as sweet and inviting and I found myself again embracing and being embraced by the natives. Many have said that Lillehammer pulled off the perfect Olympics. Dan Jansen won a gold medal for the ages, Norway’s Johann Olav Koss was heroic in winning three golds all the while eschewing any personal glory or prosperity to raise money and awareness for Bosnia. There was a palpable feel-good atmosphere to the Lillehammer Olympics. My cozy accommodations sat right above a frozen pedestrian mall that serves as Lillehammer’s main street, the Storgata. During the games it was a melting pot of world cultures. The atmosphere had the flavor of a pep rally in a small college town. I fell asleep every night serenaded by a chorus of national anthems from a band of revelers celebrating their triumphs from earlier in the day. The world had gathered in a town of only 22,000. For those of us fortunate enough to experience it, the warmth still radiates. Finally, in 1998 the Olympic Winter Games visited the Japan Alps and the historic city of Nagano. Here, the cultural awakenings were just as fascinating as France and Norway. The venues may have lacked the flag waving frenzy that was so ubiquitous in Lillehammer, yet there was a deep emotional undercurrent of history and tradition that flowed throughout the games. Again, for those of us lucky enough to experience it, our lives were forever changed by our visit to the Far East. The Olympics has touched all people. Young or old, black or white, athletes and non-sportsman, everyone is a fan. However, I can’t imagine anyone devoting more energy and passion for researching the history of the Olympics more than Bill Mallon. What makes him even more remarkable is his versatility in life. I first met him when he reached golf’s highest level of competition, the PGA Tour. He has followed that with a gold medal career in medicine. He is peerless when it comes to his depth of Olympic knowledge. Only a man with a passion for his subject could come up with this Olympian effort. His research is so comprehensive and complete that I have no doubt the next time I broadcast the Olympics, Mr. Mallon will be sitting at my side assisting in the effort. He just better bring this book with him.